Watercolor illustration copyright by Marc Johnson. On Thursday August 5, 1954, Axel and His Dog starring Clellan Card premiered on WCCO-TV (Channel 4) in Minneapolis / St. Paul, Minnesota. Axel, a wacky Scandinavian, had been a staple of Clellan’s radio act since 1937 but this show marked his debut as a children’s television character. The program initially featured only Clellan as Axel plus Old Log Theater director Don Stolz playing Axel’s wordless dog Towser — but soon the talkative high-strung feline character Tallulah, also played by Don Stolz, was added to the cast. Later Mary Davies as Carmen the Nurse joined the company, and by 1963 she became Axel’s co-host. Axel’s goofy humor, which embraced children yet never condescended to them, helped make the show a huge hit. Adults as well as kids watched the program. There were times when more than 25% of ALL Twin Cities televisions were tuned to Axel — an incredible figure unlikely to be equaled today. Clellan continued to do the show until just weeks before his death on April 13, 1966. 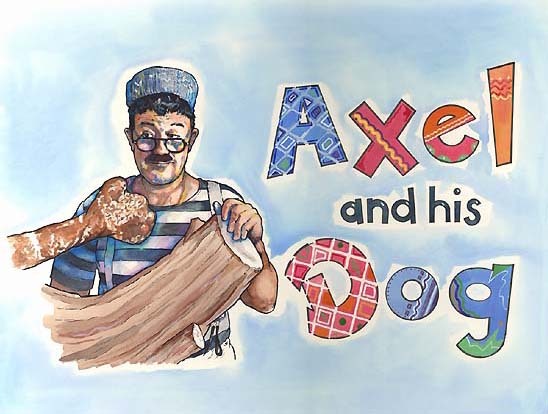 Here is a collection of material featuring Axel and related to his television show.